Enterprises and individuals may donate funds to the Royal Canadian Regiment's Children of Fallen Soldiers Educational Fund and/or to the CHEO Foundation. Donations must be made by cheque in accordance with the instructions below. They will be gathered by the Titans and presented together from the Titans’ Heroes Cup event to each charity. Note that 100% of donated funds will be given to these charities. Cheque payable to "CHEO Foundation". 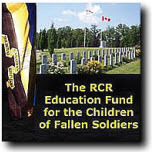 Cheque payable to "The RCR Trust Fund", and annotated with "for the Children of Fallen Soldiers Educational Fund". If you want a charitable donation tax receipt, accompany your cheque(s) with a note specifying the address where the receipt is to be mailed. Our volunteer representatives will accept hand-delivered donations on the day of the event. However, it would greatly simplify things if donations could be mailed to us by July 22nd. What do you get for making a donation? Enterprises and individuals who support the cup this year will be part of a proud group of visionaries. They will plant the seeds for a recurring, growing event that will have a significant positive impact on the lives of children in need. In addition, the Titans offer a benefits program that scales in scope based on the size of your total donation. For details, review this document. We hope that you will share our enthusiasm for this very unique charity occasion. With your support, not only will help for children in need be provided, but we will also put Ottawa squarely on the map for having been the first Canadian city to offer beach water polo.